My recent opportunity to see and wear an Original Six Frock Coat (see left) reminded me of my efforts to reproduce the coat way back in 1985. I was at college in Harrow Weald taking my A-Levels in Technical Drawing (Engineering) and Art. 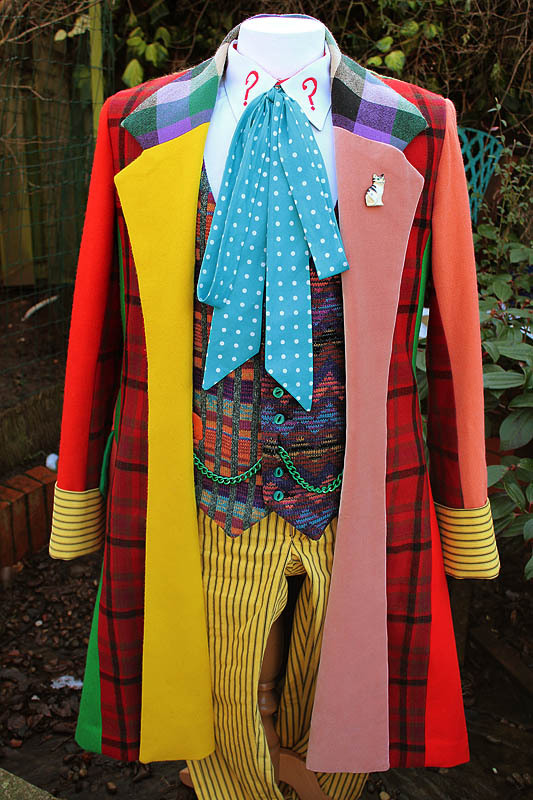 At the time Colin Baker was Doctor Who, and despite it being an appalling car crash of colour and textures, I was quite taken with the Frock Coat he wore. For the first time I was moved to actually have a go at making my own – mainly because I felt you could ‘see’ the pattern, since every panel making it was a different colour, the individual shapes could be easily made out. Now, you need to wind your mind and understanding back to what things were like in those days. There was really only one source of pictures for Doctor Who: The Doctor Who Monthly Magazine. In those days it was principally a black & white affair, with only a colour cover and centre spread, and occasional a colour insert page running through it, but that was rare. The June 1984 issue (see right) introduced us to The Sixth Doctor, and had (at the time) the best clear image of his costume - in colour! This was my clincher, as I could use it as reference for both pattern and fabric matching. 1895 was my first year at college, and I still had my old school blazer (a cheap polyester black number) and I took this apart to crib a pattern for sleeves and the main body of the coat. From there I created the curved back seams and the skirt part by simply doing what I felt was right. My fabric quest at the time was not as tortuous as you might think. Granted I didn’t have access to the interweb, and thus the rest of the planet, but in those days there was much more of a make-yourself mentality which was fed by numerous haberdashery and fabric shops in almost every high street. The desire to have clothes by designer names was less the imperative. So having all these shops to hand was a distinct advantage as I could go on a quest and come back with half a dozen promising fabrics to fit the bill. Along the way I had a couple of lucky finds, as well as some more hard to track materials. I found a pair of yellow and black striped trousers in a ladies dress shop while out shopping with my Mum, and bught two pairs: one to wear for the costume and the other to cut up to make my cuffs. I was equally lucky to find a near perfect match for the collar fabric, though what I did trace had slightly rectangular panels of colour rather than perfect squares. But since the collar was going to be cut on the cross and only partly seen, this did not matter. I hunted high and low for a red and black tartan, but could only find stuff with a thread or two of white or green sneaked in to ruin it for me. I did however find what I was looking for on Regent Street. It was not the exact same pattern of lines, but at least it was limited to just red and black, so was satisfactory in my eyes. The only draw back was it was £35 a metre – which in the late 80s was a fortune – especially given I was still at college and not out earning money! But it was essential to the coat, so needs must . . . 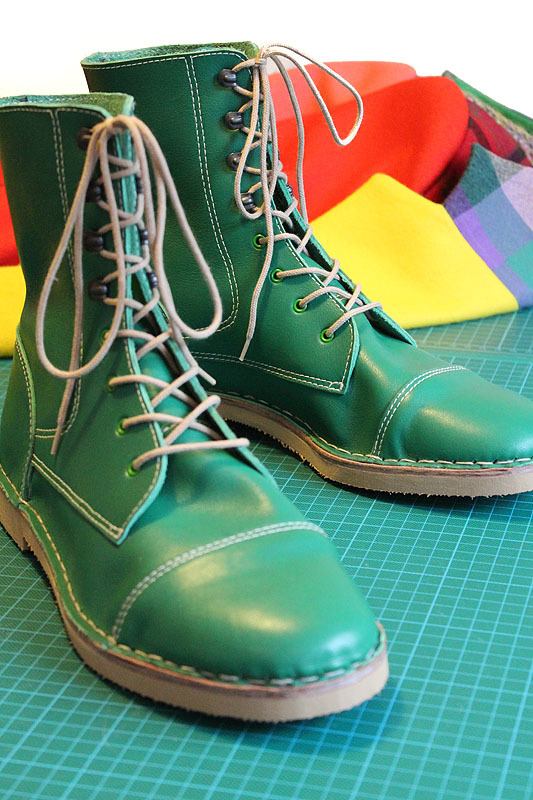 The rest of it was relatively easy, being plain colours in purple, green, pink and yellow. So I set to work on my Mother’s old Singer 28K machine (the same model I now use for all my work). I slogged and plodded away at it for a couple of weeks before finally emerging with my pride and joy! (see below – the coat, trousers and necktie are my own, the waistcoat is by Cloth Ears on load from my friends). I was not really a convention goer in those days, so the only outing it got was to college where I would wear it for my art classes! I did not entirely look out of place, as we had a couple of goths and some quite flamboyant characters in the mix. My work did get the attention of the head of the Textiles and Fashion course, who asked to see it. 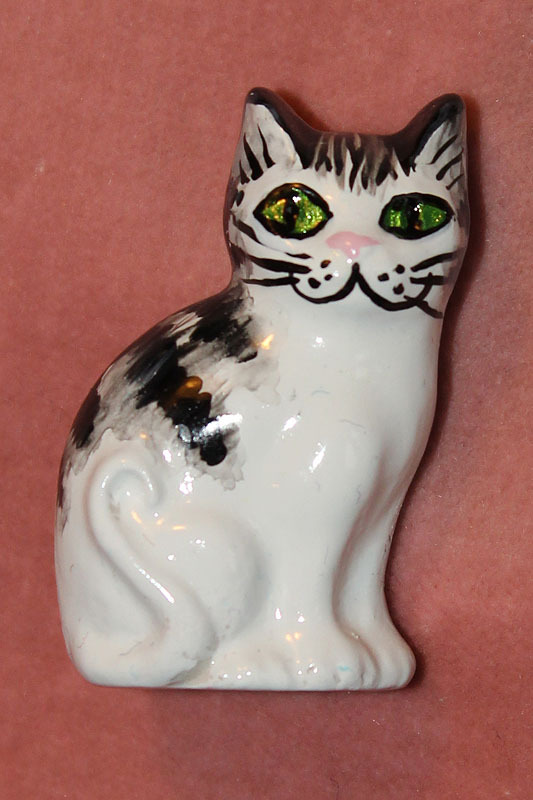 She was most impressed and hailed my use of colour and design. I tried desperately to tell her it was a reproduction of someone else’s work, but she was having none of it and invited me to join her class for the remaining few weeks it had to run. Normally she would insist on seeing some examples of drawn design work as well as various items of practical experience, but apparently my Six Coat was more than enough to get me in. I attended a few of the classes, but since I had come so late I had missed a lot of the basics and being a bit of a rouge outsider, no-one really talked or took to me (I was quite shy at the time, struggling with a stammer that made meeting strangers a little daunting). Anyway. Time passes and I leave college. My Six Coat goes in the wardrobe and I find a full-time job, which gives me the chance to start doing what I had been wanting to do for a few years: make my own video films. 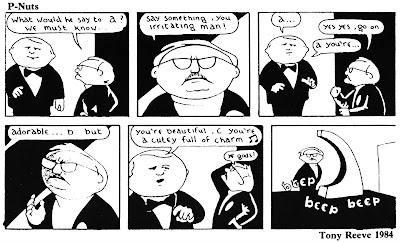 My first film was based on a long running cartoon strip that appeared in the society magazine. It was called P-Nuts and had Patrick McGoohan, the lead star, drawn as a potato-headed squat character getting up to all manner of Prisoner mischief (see some examples below). I could see the potential and contacted the cartoonist, Tony Reeve, who agreed to me making a video version. Now, when I was back in college we had a couple of fun days organised by students. One of whom arranged a ‘Funny Hat Day’. I forget his full name, but his surname was Friedlander and come the day he wore a hat which was basically a rubber skullcap with drips coming down from it, making it look like he had pot of paint emptied over his head. 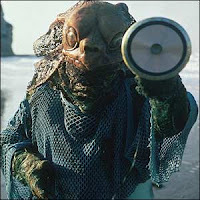 This got my mind thinking and I eventually asked him – ‘Is your dad John Friedlander, who made the monsters for Doctor Who?’ The answer was yes!!! We chatted, and I managed to arrange a visit to meet him. He was very nice to chat to and he told me some secrets of how to sculpt in clay and cast into plaster before making latex positives. He also showed me one of his favourite creations: Davros, which he had cast into fibreglass (see right) form the original mould to preserve it forever (the latex masks become brittle and disintegrate after a few years, so the original screen-used mask is not what it was). THIS was how I would bring the P-Nuts characters to life. Anyway – cutting an already long story short – I made the film and included a Doctor Who skit as part of the plot. At the time of making, Colin Baker was The Doctor – and the Sixth incarnation at that (the lead character in The Prisoner is known only as ‘Number Six’). 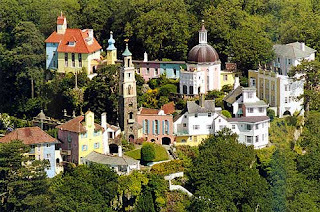 The Prisoner had been shot partly on location in Portmeirion village in North Wales (see left), which had later been used in Masque Of Mandragora where it doubled for Renaissance Italy. It seemed an obvious target for my plot. I called my film The Penny Farthing Mystery, deliberately making no reference to P-Nuts so as to keep it a surprise for the audience. 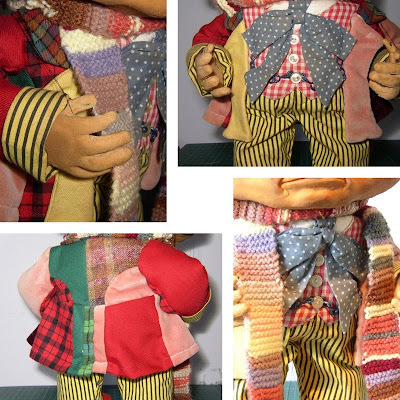 I had to devise a costume for my Doctor Number Six, and I had a lot of left over scraps of fabric from my full-sized Six Coat, so I used these to make a dinky version for my puppet (see right). 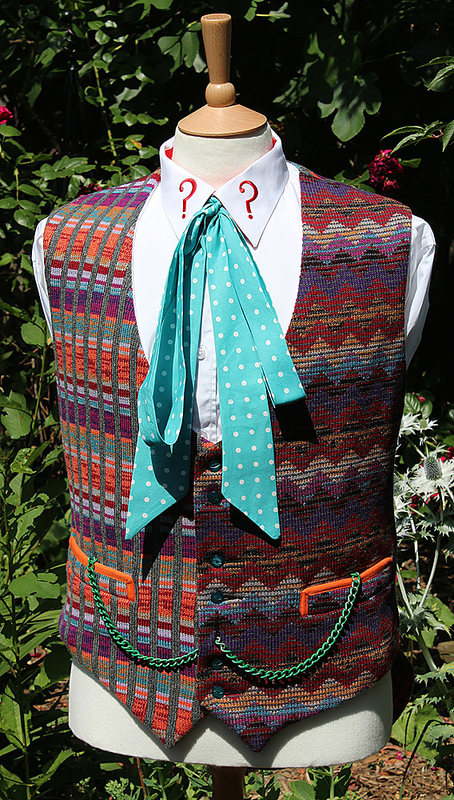 I also had to source a number of specific fabrics with scaled-down patterns to use for the collar, the tartan and the gingham for a waistcoat (see below). Otherwise, enjoy and have a good laugh! Since publishing this entry, I have had a number of comments and enquiries as to what the rest of the P-Nuts: The Movie was like and what it was all about. I have now uploaded then entire 30 minute film to YouTube, breaking it down into Six 5-minute parts. In which a family’s channel-hopping discovers the premiere of P-Nuts: The Movie. Paddy wakes up in a strange village and meets its some of its equally odd inhabitants; explores the village through the Information Board; takes a local taxi ride, and gets fleeced of his American Express card! Using F.I.D.O.’s mind-bending technology developed by Number Fourteen, Number Two tries to discover what Paddy might have done after his shock resignation from his popular Blunder Man series. Next morning Paddy takes a wander around the village, finding it as enigmatic as its residents. With the lines between dreams and reality becoming blurred, Number Two finally finds out what Paddy really wants to do having quit Blunder Man ... but will his script editor, George Markstarkers, like it? Loved the video at the end. I did laugh. Loved the ending too with his little feet. It really seems to have stood the test of time. If I wasnʻt told otherwise, I would have assumed it was something from the tv! Interesting stuff. 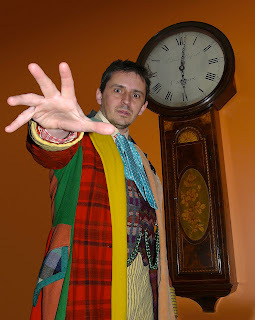 And to my (admittedly untrained) eye, your original Sixth Doctor coat holds up very well. I'd love one of those. I came across your YouTube uploads of all six parts of 'P-Nuts: The Movie' a while back - thank you for making them available! Then today, I found this page and thought that I would ask about its sequel. Being something of a 'Prisoner' fan, I wondered if you would ever consider putting 'Paddy in Wonderland' on YouTube?